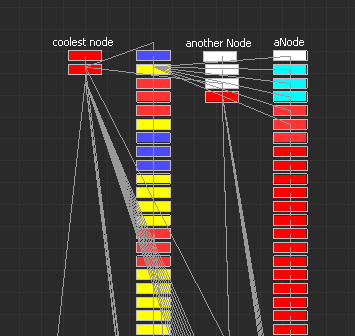 Trust me, it works on my machine: Motionbuilder: Where are my nodes bro? Motionbuilder: Where are my nodes bro? Today I discovered another surprise motionbilder throws at you when working with heavy scenes. In the schematic view all nodes can be spread all over the place, in fact so far or near to each other that you are getting display errors and the graph will start flickering. Thankfully you can script the position of these node positions. The solution was to write a quick script to reorder them based on the hierarchy. I hope this will help others struggling with this problem as well. Here is the script to do this. And yes in case you are bored out of your mind you can also arrange them in a circle. Just change line 30-39 to this. Was the auto layout causing a problem or trying to do a custom layout? Either way this is a nice script, thank you for sharing. I actually don't know how it happened, but auto-arrange didn't solve the problem either. I'm guessing file merging could be a cause for this. I have run into this problem lately. It started when I opened an .fbx from MB2017 in MB2014. Very odd issue and frustration. It is propagating into other MB files now :/ Thanks for the script to fix it tho.